Oooh … love that intense yellow, Carin. 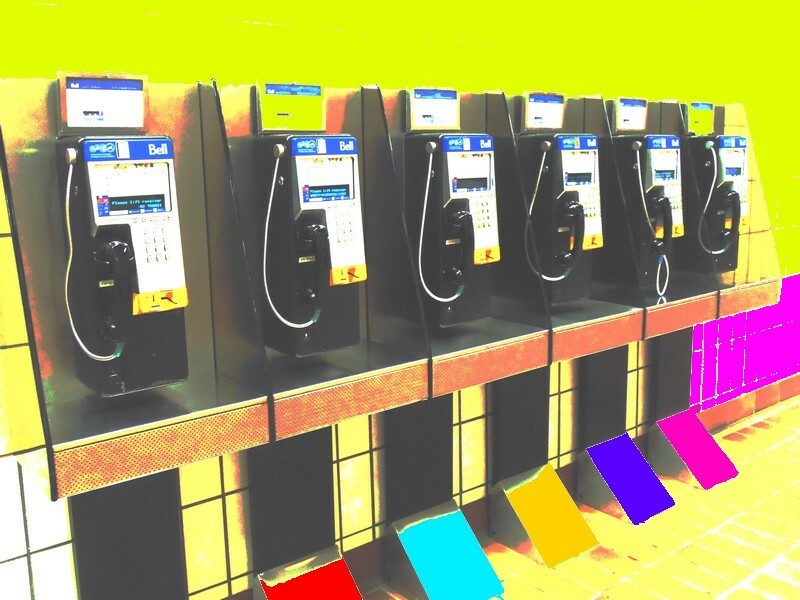 Only you could make a bank of pay phones a work of art! I wanted to give it a kind of faded look. But with pizazz. This was taken at Union Station. Not that long ago there’d have been a line waiting to use them. Great capture, Carin. The phones create an unusual pattern, but the colours below really pop and make the shot. What ARE those wedges, and why are they different colours? There’s an interesting tone to the overall shot that makes it feel a bit surreal and intriguing. Ha! I love how they are lined up in army formation … defying the possibility that they are out-dated. Lovely to see them there. I am sure they never will be unnecessary. But this group does look so determined … and then how clever of them to deck themselves out so colourfully, making themselves irresistible. Great pic! I can’t remember the last time I saw a public phone row like that. This is a fantastic composition and to analyze why it is, I looked back at an article by Steven McCurry I posted a couple of weeks ago: https://elizabethyeoman.wordpress.com/2015/04/11/rules-of-composition-1/ Your photo meets all of the criteria of good composition except, of course, the ones about photographing people. Examples: patterns and symmetry are pleasing to the eye but the best of all is when the pattern is interrupted. For more about why your photo works so well, have a look! Tho’ I do like that link. Well you just know I love these kind of photos Carin. It’s a wonderful composition and an historical document at once. It’s interesting to think about a time when there would have been a line of people speaking in hushed tones, maybe even looking around because others are waiting to use the phone! Your treatment of the scene gives it a bit of a whimsical touch, as if to say the serious business of making that phone call isn’t maybe quite so serious after all. Who knows what conversations took place here? Lovers setting up a rendezvous, kids checking in with Mom, or even drug dealers setting up the deal? What an eye you have!